At least it feels that way. Lately I have been so busy with so many things that I want to share with all of you but I haven’t had time to do it. So I’m going to quickly run over everything and go into details in their own post. Also it’ll help me remember what I wanted to write about. I am continuing to make progress through The Dresden Files. I’m up to Proven Guilty although I do have a short story I need to read quick before moving on. It really is cool going though all of it again. But seeing as I’m reading everything except the short stories on my Kindle (the Paperwhite makes reading before falling asleep so much more convenient! ), I was really starting to jones for a book. Thankfully I had picked one up. I had stopped in a Barnes & Noble to use the restroom quickly when I saw a book that I had heard about on NPR (I think) and really wanted to read it. Quiet: The Power of Introverts by Susan Cain is an amazing and, for me, freeing read. I have probably mentioned it before, but I am an introvert. My hubby is an introvert. Many on my dad’s side of the family are introverts. But America is the land of the free and home of the extrovert. It is hard living as an introvert in an extroverted nation, but Quiet helps me to realize that it’s not a bad thing. I’m barely a quarter of the way into it and I love it! There will be a very thorough post, or two, about this wonderful book! Ever since taking a basic photography class at school, I’ve been getting more and more into photography. I’ve always enjoyed it, but that class inspired me to start investing more into it. Recently I’ve invested a little bit more. I bought a 35mm lens and a couple of ND8 filters, one for the 35mm and one for the lens that came with the camera. I think that 35mm lens is going to change how I take pictures in a wonderful way. This is a complex one. First, while I am working on The Dude’s on the Grid sweater, I’ve also been inspired to get the supplies for a couple of baby blankets. Friends of ours recently had a baby and I wanted to do something for them. Then I remembered that my sister requested I make a Gryffindor-color striped baby blanket for her future nursery. No need for it yet, but I thought “Why not find the pattern now and use it for our friend’s blanket?” So I found a great blanket pattern, and ordered some great purple yarns and needles from KnitPicks. Hopefully I’ll be able to get started on it soon. Second, I have a new job. I’m working at Jo-Ann’s. It’s really stressful suddenly working an almost 40-hour-a-week job where I’m on my feet for most of that time after working at a desk job for over five years. I’m slowly starting to get used to it again. But add school to it and I’m having a hard time finding a good balance that includes time for myself. I’m really hoping that writing here will give me some of that me-time again. Fall has inspired me to start cooking again. Between cranberries and squash and Brussels sprouts and asparagus, my fridge is full of food waiting to be cooked. As things happen, pics are posted to Instagram. Hopefully there will be posts here to talk about the wonderful photos I’m slowly filling up my Instagram with. Okay. Now I think I’m going to meander toward bed. I’ve rambled for long enough. Jim Butcher is so awesome! 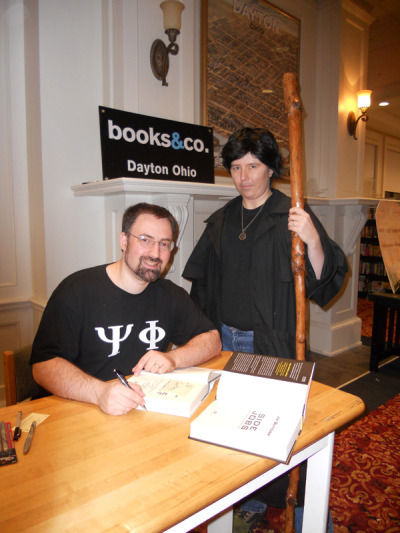 Back on July 29th, Jim Butcher came to the Books & Co. in Beavercreek, Ohio as part of his Ghost Story book tour. I got there at least half an hour before they were going to start giving out the numbers for the signing line and they had already filled up the seats. I was hoping that I would get one this time, but it seems that since it was on a Friday, a lot more people were able to get there. Because, not only were all the seats taken, but there was a sizable line and they had run out of the book. Yes, they were out of the book that people were there to buy and get signed! Luckily they said we could still get a number without the book. I was quite disappointed though. I really wanted to get Ghost Story and start reading. So I got in line and was really glad I had my staff to lean on. Oh yeah, I forgot to mention, I went in full cosplay as Harry. 🙂 There was at least one other person who wore a long leather coat and a black glove on his left hand. But I was the only one who even came close to looking like Harry. 🙂 It was a lot of fun. The only problem was I don’t have contacts yet, but I wanted to stay in character. So I had my glasses in my pocket. The line finally started moving and when I got to the front the staff member was very impressed with my cosplay. 🙂 She reassured me that I could still get my book, White Night signed despite the lack of Ghost Story. I headed upstairs and stood up at the top of the stairs, but out of the way of the flow of traffic. It was a good spot. As long as the people in front of me stood still. Jim came out, grabbed the mic from the podium, and plunked down on the table. He wanted things to be comfy and informal. He asked us if we just wanted to get right to the Q&A part and no one objected. 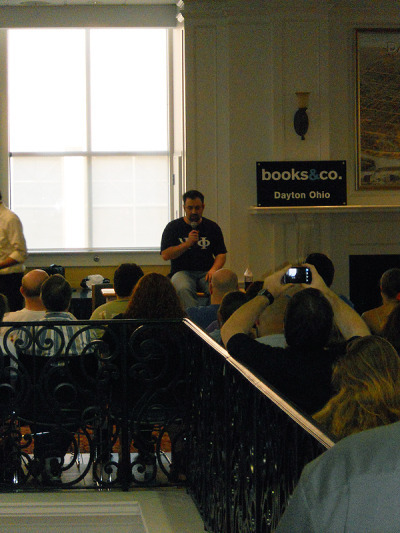 There were some really great questions asked about all sorts of things; the Dresden Files, the Codex Alera, future writing, geek stuff that had nothing to do with any of that. I finally came up with a question to ask. When he called on me he said, “You with the staff!” 🙂 I asked him what his favorite part about going to conventions. He said it was meeting “all of you”. That was so awesome and I knew he meant it. While he is a fellow geek, his favorite part is talking with us about all sorts of things. That is just awesome! Soon after the signing started. They limited people to three items at a time. If you had more than three, you had to go to the end of the line to get three more signed. Also there would be no posed pictures. They wanted to keep the line moving. I was a little disappointed at that because I was hoping to get a good picture with him. Since I had my number and it was a way down the line, I decided to go and get a copy of Side Jobs since I was there and it doesn’t seem to be coming out in paperback anytime soon. Slowly the chairs emptied as people got their books signed and I went up and grabbed one. After a while my number’s group was called and I rushed to get in line. When I got up there, Jim said “Very nice!” which made me quite happy. I handed him the books and we talked a little. I gave the same staff member as before my camera to get a picture while he was signing. Luckily she had me go stand next to him so we could get a good picture. They were both very impressed that I had made the coat myself. Jim even called it “quite a coat”. I don’t think many people put that much effort into their Harry’s. It was the best experience I’ve had in cosplay yet. Getting a thumbs up from the character’s creator is awesome. And I got my favorite in the series, White Night, and Side Jobs signed by the author! The rest of the pictures are on my Tumblr. Just click the photo! Jim Butcher! His Ghost Story signing tour is stopping at the Books & Co. in Beavercreek! I am so excited. I’m working on and almost done with a Harry Dresden Cosplay for Dragon*Con in Atlanta, Labor Day weekend. I decided that I’m going to get it done and wear it to the signing. It’ll be awesome to get not only Ghost Story signed, but also White Night, while dressed as Harry. Hopefully I’ll be able to get a picture with him. That one may get framed. Trust me, there will be a post afterwards. But, if you’re a Dresden Files fan, check out the tour information. If you have the opportunity, go to it! Especially if you haven’t had the wonderful opportunity to see Jim talk. It is so much fun and he is such a nice, and geeky, guy. He is polite and fun right to the end.